We’ve managed to get a video of the future Audi RS Q3. The vanilla version of the compact luxury crossover has been filmed while it was checking out its new and amazing powertrain at the Nürburgring. You don’t have to be some engine-expert to figure out that the 2020 Audi RS Q3 hides a quite powerful mill under the hood, but we, on the other hand, know what exactly powers Audi’s high-performance compact SUV. The vehicle is definitely using an awesome 2.5-liter TFSI engine. Truth to be told, you can find the mighty five-cylinder turbo mill beneath the hood of the current model. The second-generation RS Q3, however, uses an updated version of the engine which will be able to kick out a lot more power from today’s 310 horsepower. Even though some reports claim that the new-gen model is going to squeeze off almost 450 ponies from the unit, this is not going to happen for sure. Instead, the updated 2.5-liter turbo will most likely deliver exactly 400 horsepower and 354 lb-ft of twist. The German automaker will probably couple the engine with a 12V mild hybrid configuration to lower emissions. 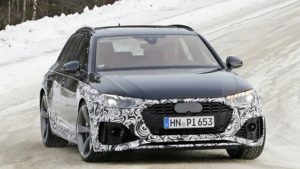 Of course, the 2020 Audi RS Q3 will be paired with standard Quattro all-wheel-drive system and a dual-clutch seven-speed automatic transmission. We know this because Audi never messes with its RS models, so they always use the strongest DSG gearbox. Since it’s going to sit on the new MQB platform the next generation Audi RS Q3 is going to become lighter from its predecessor. This will not just have a positive influence on car’s fuel economy numbers, but will also make a huge contribution to the performance figures. According to first estimates, with a few hundreds of pounds fewer and paired with the more powerful 2.5-liter TFSI the most potent Q3 will be able to speed up from 0 to 60 mph between four and four and a half seconds. Even though it’s hidden beneath the camouflage, the testing prototype shows a few details which are usual for the topper. The vehicle rides on larger wheels with beefier brakes. They alloys are paired with special high-performance tires, while the rear end hosts a pair of oval exhaust tips. Up front, the 2020 RS Q3 is going to feature a more massive bumper with additional air intakes. This is the high-performance SUV, but even so, it’s not going to be mated to any kind of air suspension or smart anti-roll bars. No, that’s reserved for bigger models. Since it’s going to be pretty light, the features are unnecessary, though.